Mercedes Sá is a Forestry Engineer from Argentina. She works for the national government in the Directorate of Forestry. She is not a traditional scientific researcher because her every day work is related with the supervision of conservation and management plans of native forestry resources, including restoration activities, that all the provinces of Argentina approve for the compensation of environmental services under the framework of a National Law. I read a tweet from the Iberoamerican Model Forest Network informing about this course. 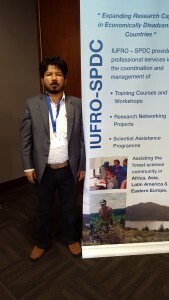 No, as my employer, the Directorate of Forestry is a member of IUFRO, I had the opportunity to participate also in the IUFRO Regional Congress for Latin American in San José, Costa Rica, and the 2014 IUFRO World Congress in Salt Lake City, USA. I find the workshop topic highly interesting. In my previous job I gained experience with landscape restoration work and for my current job it is also important for me to be up-to-date in this area. Forest degradation and landscape degradation related to agriculture, for example, are an issue in Argentina. I want to learn about new tools and activities that can be included in the forest management and conservation plans in Argentina. As the Directorate of Forestry is evaluating these plans, this knowledge will be very useful especially when it comes to capacity building. Yes, I like the way the topic is being presented and, as I work for a policy maker many of the issues that are being addressed in the context of science/policy interaction are familiar to me and important for my work. I found the announcement on the IUFRO Facebook. Yes, and when I read the course announcement it was actually the first time that I heard about IUFRO. After that I went to the website and I applied for membership as an Associate Member. The World Forestry Congress now is also the first big event that I am attending. So this is really exciting. What is the main reason why you wanted to participate? I am responsible for all forest reserves and plantations in the central region of Malawi. Most forest reserves, however, are degraded and need to be restored. I would like to learn more about this topic and hear how other countries are managing landscape restoration. And I am here to network. Why is landscape restoration important in your country/region? What have you gained from this workshop? I have learned about experiences with community management in other countries, e.g. in Latin America and also Nepal, as a way of restoring landscapes. I find it valuable to interact with people from different backgrounds and hope to continue collaboration with them. I also realized the need to have a communication specialist, because often results are not well communicated especially to the stakeholder groups such as farmers or policy makers. Will you be able to use this knowledge in your work? 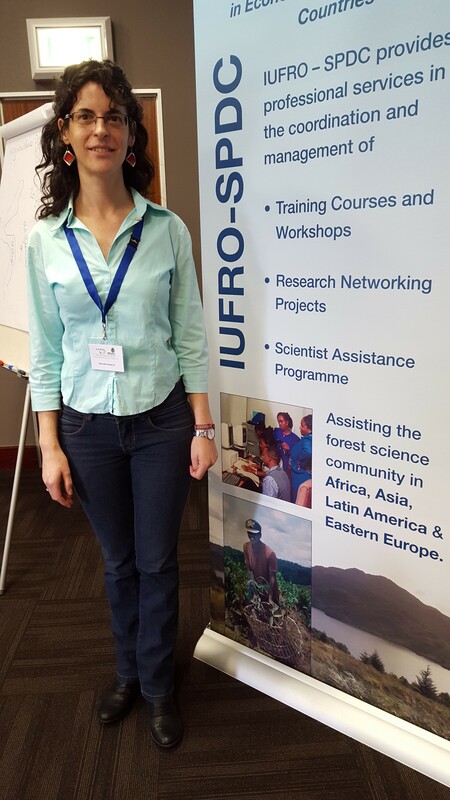 Definitely, when I come back I will inform my employer about what I have learned here and, I will recommend an affiliation with IUFRO. I will also suggest to the Lilongwe University of Agriculture and Natural Resources to become a member. 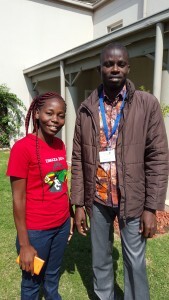 Badabate Diwediga is from Togo and is currently a PhD candidate in Climate Change and Land Use at Kwame Nkrumah University of Science and Technology (KNUST, Ghana). He is interested in the use of GIS, remote sensing, and field measurements to assess the historical land degradation and fragmentation in rural areas of Central Togo. I read about it on the IUFRO website and on IUFRO’s Facebook. Togo has one of the highest rates of deforestation in West Africa, even in Africa. Forests are used to support the livelihoods of the people. It will be important to come up with tools to restore the degraded forest landscapes as this will really help people through maintaining forest ecosystem services. 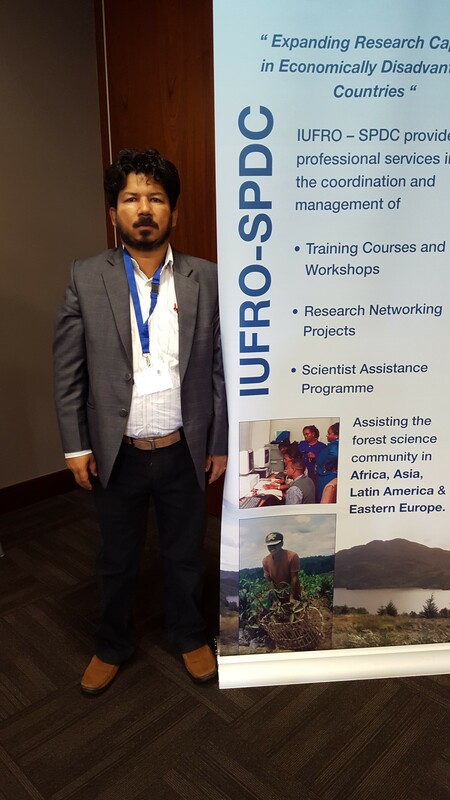 As a young scholar, I am glad to attend this IUFRO-SPDC training workshop and hope to learn more in order to strengthen my skills and contribute to the promotion of adapted land use. I am interested to learn from experiences and success stories from other areas of the world, and be part of an international network working on forest management and landscape restoration. This will also help me in my career. Will you be able to use this knowledge in your research / in a particular project? Yes, I can use this in my thesis, especially when it comes to policy recommendations as this is an important part of my thesis. The course helps me to understand some concepts that were not so clear to me before. Yes, I would, and it would be great if such workshops could be expanded to increase participation and, thus, enhance cooperation. Nirmal Kumar BK works for Forest Action in Nepal and is doing a PhD in Kathmandu University. In addition, he is a researcher in a landscape level community forest based climate change adaptation project in Nepal assessing the vulnerability and adaptation of six community forestry user groups. Apart from social networking, this project comprises forest restoration and river stabilization work. I know IUFRO because I regularly read IUFRO publications. I found the announcement on the IUFRO website. Of course, I am interested in the topic because I am involved in forest and landscape restoration work in Nepal. In my work I often encounter difficulties and I hope that through this workshop I can get the competencies to overcome such difficulties. Landscape is not only geography, is has social dimensions and institutional dimensions as well. So I expect from the workshop that it will enhance my competencies related to how to integrate community level forest management into landscape level management with a view to local practices, institutional mechanisms and policy barriers. In addition, I also would like to share experiences that I gained during the work of this project and contribute additional knowledge and skills to the participants of that workshop. Yes, definitely. I hope to be able to apply the knowledge for local adaptation strategies, science/policy interaction and knowledge transfer and sustainable forest management in general.